Hanoi (VNA) - The Vietnam Football Federation (VFF) has appointed Mai Duc Chung as acting head coach of the national men's football team. Chung replaced coach Nguyen Huu Thang, who announced his resignation after the U22 team lost in the ongoing 29th Southeast Asian Games (SEA Games 29) in Malaysia. VFF President Le Hung Dung thanked Thang for his hard work with the team in the last one and a half year. He regretted that the team could not succeed at the games and accepted Thang’s decision to quit. After a discussion, the VFF chose coach Chung, who had just won a gold medal with the women’s squad a few days ago in Kuala Lumpur. In the past, Chung had taken charge of the position when coach Alfred Riedl resigned in 2007. He was head coach assistant for national team and the U22 squad for years. However, Chung would only be responsible for the team when they play Cambodia in the Asian Cup qualifier on September 5, because later, he would be busy with the women’s team, which will prepare for the women’s Asian Cup final in Jordan next April. “Chung is a good trainer who loves his job. The man has always been lucky whenever he coached the women’s team. Although there is a difference between the men’s and women’s squads, I believe he can manage it,” said veteran coach Le Thuy Hai. As planned, the national team will be convened in Hanoi on August 29 to practise for their match in Phnom Penh. According to Le Hoai Anh, VFF general secretary, the VFF would find a suitable coach for the team after the September game. Speaking with the media a few days ago, Chung said he was ready to take the charge if the VFF offered him the post. “I am a member of the VFF. I will do whatever the federation requires me to do. If they need me, I will agree,” he said. 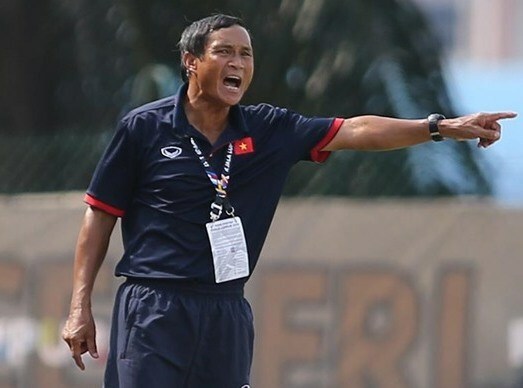 Chung is the only coach in Vietnam who had success both with the men’s and women’s football teams. The 66-year-old grabbed three SEA Games gold with the national women’s team.